When creating long surveys for fieldTask you may want to try out a newly created, or modified section, that is a long way from the start. Its time consuming having to swipe past a lot of early questions and even worse if these have been set as “required”. 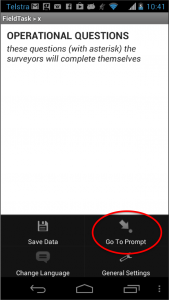 To quickly get to the right section you can use the “Go To Prompt” feature. Figure 1. Start the survey in fieldTask or, odkCollect, select “menu” then “Go To Prompt”. A list of questions will be displayed which you can scroll through to find the question you want. 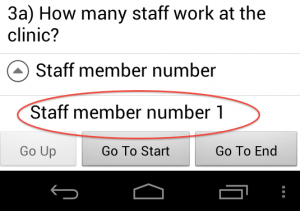 If you have repeating groups in your survey then this list of questions will initially stop at the repeat group. To go further press on the downward arrow at the left of the repeat group name. Figure 2. Then press on the name that will appear at the bottom of the screen. The questions in the repeating group will be shown and you can continue to scroll down to find the section that you want to test. This entry was posted in Smap Hints and tagged fieldTask, odkCollect, survey, testing on August 3, 2013 by Neil Penman.